During a visit with the in-laws in ATL, I decided to build upon my budding fly fishing skills and do a guided drift down the Chattahoochee River. The “Hooch” runs 430 miles from Lake Lanier (famous for its inland Striper fishery) down to the Gulf. Right from the start we were catching. I christened the new rod with a little 6″ brown near where we put in and then as we drifted down, proceeded to hook up with quite a few rainbows between 8 and 12″, nymphing with a double rig (beadhead pheasant tail on top, the Hooch-special “blue assassin” nymph on the bottom). My guide educated me how many of the ‘bows were “wild” (we could tell by the white lines on the fins–these are absent in stockies or wear down in stock tanks). The bows were everywhere (there’s about 5000 fish per square mile), and you know I love it when ‘bows jump! 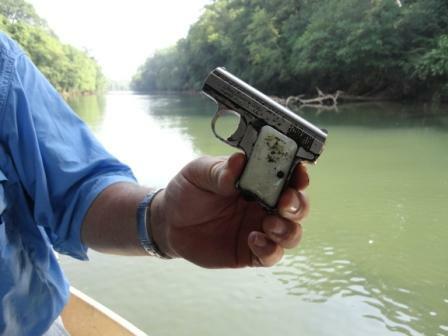 As we drifted by a bridge, I noticed a white pearl gun in the water and we had to go back and retrieve that one. Gordon being a shooting instructor pointed out it was a 25 caliber “Saturday Night Special.” Apparently lots of people throw guns from bridges down South, but this was a first for both of us. As fun as it was to pull out the gun, I was eager to get back to fishing. Later, I realized I should have been a bit more patient. People don’t throw guns off bridges for the hell of it. We turned it in to the park ranger after the drift. 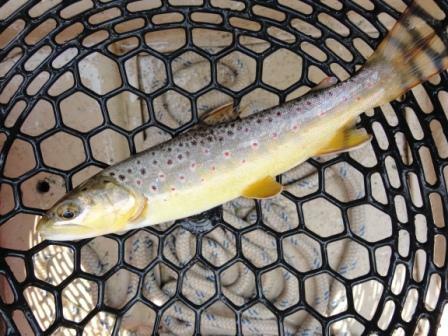 By mid-day the nymph fishing had slowed down and Gordon suggest I learn how to do streamer fishing on a sinktip line. 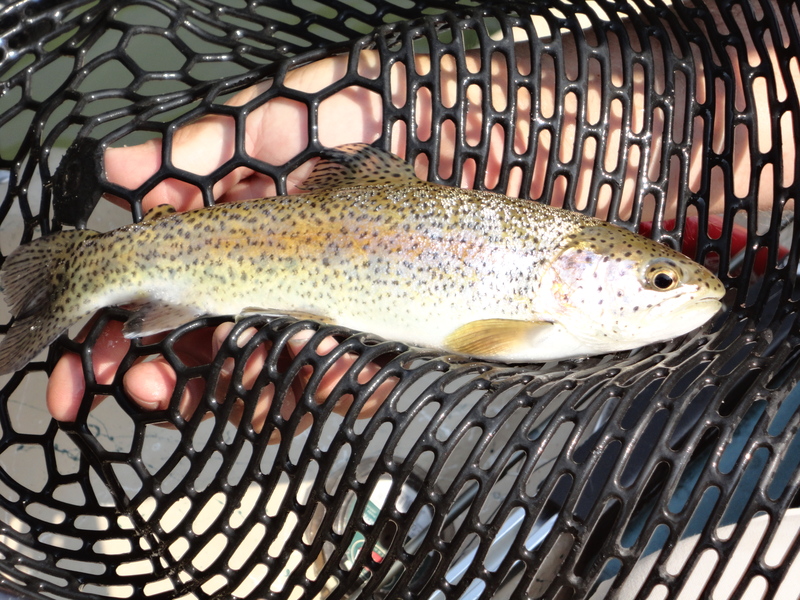 It was cast “strip, strip, strip!” and WHAM watching a trout rise up, flash and slam the fly. Incredibly cool. I missed soooo many fish though because I could not set the hook properly, but finally it all came together. 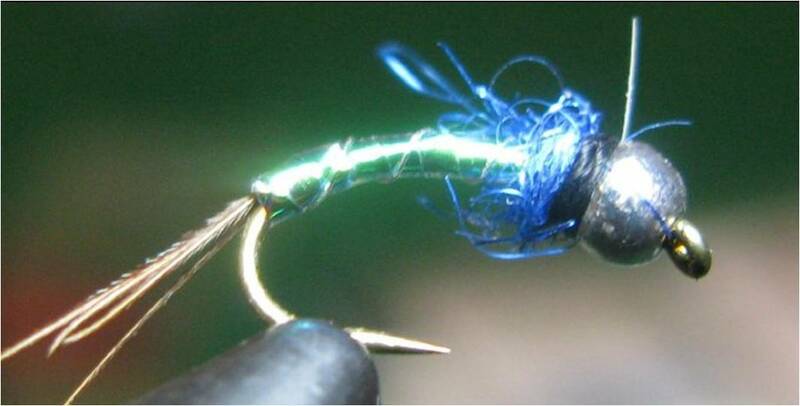 I cast to one lay down and worked it methodically, with the streamer. Off the center of the log, caught a ‘bow, then at the bottom of the laydown 5 min. later, a little brown, then at the top of the laydown, another ‘bow. Given it was Memorial Weekend, I had to give a little prayer on the water for the fallen and our veterans. My father is a vet, Gordon was a marine, and now his daughter is one. During the day, we talked about a great many things, conservation, the state of the job market–but it was clear Gordon cared greatly for his home waters, and his family. Fishing can be a solitary sport for sure, but its also a brotherhood, and a path to meeting new people and experiencing our fellow man. 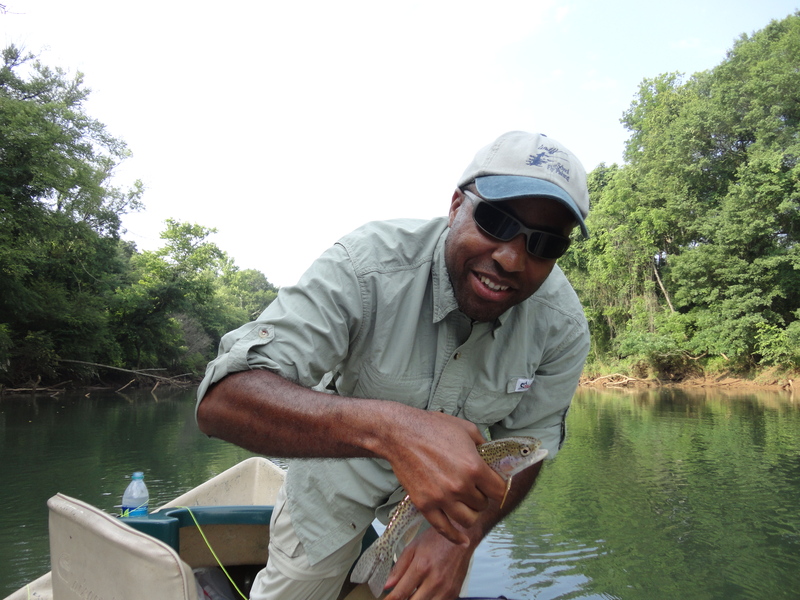 The next day I went out, bought some waders to stow in Atlanta for future trips, and then waded the Upper Hooch for a few hours in the early morning in the Settlers Bridge area. 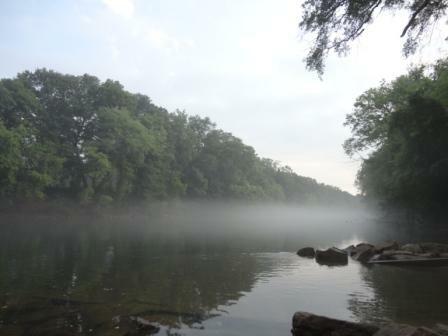 The Hooch was covered in mist and we sort of woke up together, the fish, birds, the river. I didn’t have much luck–I just didn’t have the right pattern, but I observed a lot, much more due to Gordon’s lessons. 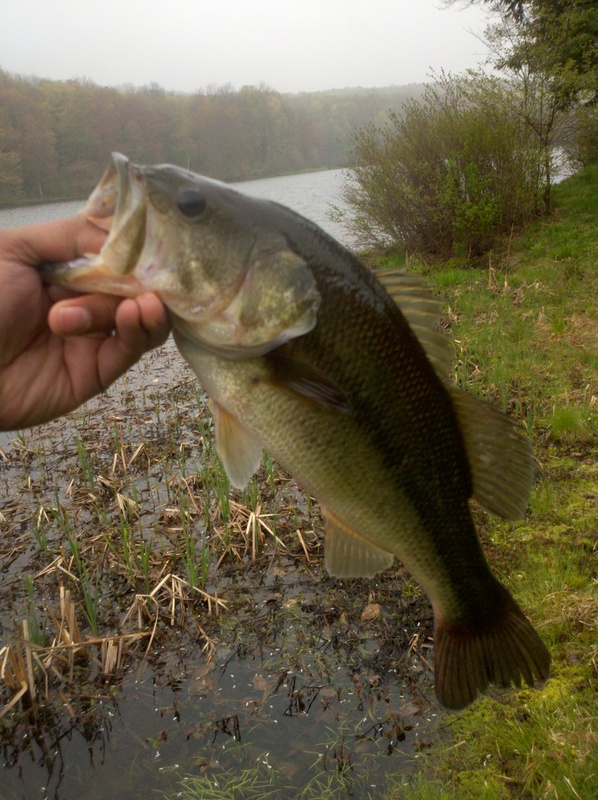 As I settled in to not catching, and enjoying a state of “patience”, I was able to focus on my casting instead, and I could literally see and feel the improvement. Fishing is a system, like learning a new language or how to play an instrument. There are great opportunities for self-improvement through focused meditation. The Hooch is a great river–one minute its like you’re a million miles away from civilization, its zen and calm, the next its splashy and noisy with college kids drinking beer and floating right by you. I caught three fish right on one side of the bank while kids were belly-flopping into the river on the other! Its full of life and energy. I came away with a new lesson about patience and letting go to enjoy what life gives you. 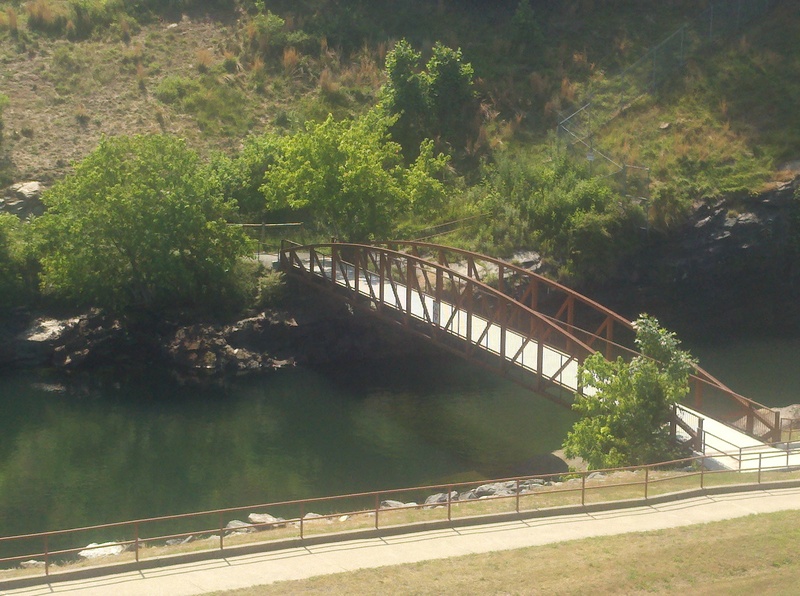 If you’re in Atlanta, you should give Gordon Walker a call to fish the Chattahoochee. I’m certain I’ll be fishing with him again soon. Today, in Film CRAFT, I bring you a mini-film festival of sorts of the work of Colin M Day, artist and cinematographer, and his talented editors, audio mixers, and crew. Somewhat fresh out of art school, Colin’s recent work focuses on profiling artists putting up shows in the San Francisco area. Is it commissioned, commercial or art? I don’t think it matters. Day’s films are evocative, personal, intimate, and like short stories, have a beginning, a middle and an end that leaves you wanting more. And that’s the point–to watch the film, and seek out the artist’s work to develop your own connection with it. I can only hope that NY gallerists and artists are taking note. I don’t know where Colin got the idea to make short films about artists for these galleries, but I hope it catches on. Being a former ad-man, and with friends in the art world, I know its nearly impossible to get the word out in the clutter–and social media doesn’t seem to have helped all that much. And telling stories about art–well its an art unto itself. And if you’re in San Francisco, check out the galleries supporting Day’s work: 941 Gallery, Shooting Gallery, and White Walls. All rights belong to the artists, musicians and filmmakers presented (and maybe their agents!). Thanks to Wooster Collective for putting me on to Day. This is my new affirmation. 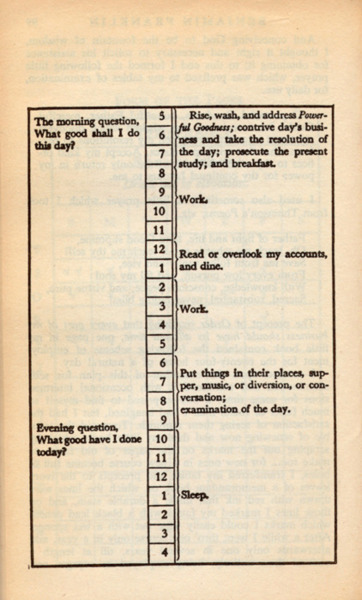 “What good shall I do today?” Over two hundred years ago, Ben Franklin asked that question. Above is his daily schedule as he laid it out. I had the pleasure of being instructed by Joan Wulff this weekend at the legendary Wulff School of Fly Fishing. On Saturday evening, after a very long and tiring day, we watched a Lee Wulff film, and almost immediately I was re-energized. So much so that my buddy and I took-off for a little midnight fishing on the Waneta Lake in the Willowemoc Wild Forest. No luck that night, but does it matter? So in honor of Joan and Lee Wulff…here’s “Salar the Leaper!” This film features Lee fly fishing for wild North Atlantic Salmon on the Miramichi in New Brunswick, Canada. The Beaverkill river valley in Western New York is home to America’s dry fly fishing tradition and heritage. The greats, Theodore Gordon, Harry and Elsie Darbee and Joan and Lee Wulff have made the Beaverkill hallowed ground, where the sport of fly fishing has been meticulously, patiently developed, year by year, angler by angler since the late 1800s. After many years of spin casting, I recently undertook a trip to the legendary Wulff School of Fly Fishing to learn at the source. My three day course was intensive, exhausting, and utterly and completely exhilarating. Among the school’s master trainers, I learned the basics, the back cast, roll cast, stream entymology, basic knot-tying, and the infamous Joan Wulff “powersnap!’ With two of my good friends, we trekked back and forth from the Beaverkill Valley Inn to the school a half-mile down the road each day. We cast into the school ponds, seeking to refine our casting. The hands-on instruction, constantly course-corrected an errant cast, slowly created muscle memory in my wrists elbow and shoulder. There was a sense of triumph of loading 30 then 40 feet of line false casting back and forth and finally dropping a fly into the target on the pond with the softest of touches. And there was always the firm hands of the instructors, correcting. “Drop the elbow, and snap!” The first day we squeezed our poles like they were baseball bats, but by Sunday night, they were wands, as we each found our equilibrium. When we finally set foot in the Beaverkill, we took a streamside lecture for another half-hour, aching, dying to cast into the river, but we waited patiently again as the master instructor described nymphing, casting into the undercut of the bank, foot placement. Let loose, I ventured furthest upstream, for the quiet, to let myself learn, fail, on my own. And there was the instructor again, “what kind of fishing are you doing? Nymphing? Think about what you want to do before you cast.” He showed me how to mend on my drift, to keep the line forward of the fly. Later, the grand dame, Joan Wulff, herself came down to the pond to provide tips. For a women clearly in her 70s, her grip was like a vice as she guided my hand through a cast that shot the line out like a rocket. Her generous smile, the smile of a teacher teaching, lit up our classroom. And among the twenty or so students, about half men, half women, we listened like little children around a campfire for droplets of wisdom. I can not begin to describe the vast amount of knowledge that was imparted to us, so much of it, that I’m sure I will only recall some lessons when I’m back streamside, but I can tell you that every lesson was complete enough to advance the student forward. There were few stragglers. If I’m guilty of romanticising the course, then I’m guilty. Sure we dealt with clouds of biting black flies and the soggy weather, the wrist and arm ache, but each night I went to sleep dreaming about my powersnap. In the blackness, I saw the rise of the trout, but just the rise, and now I realize that I’ve begun a hunt that will last me the rest of my life. To see more pictures, click on the image below to visit my photo-blog, adeadbait. I had the pleasure of visiting nearby NE Connecticut (Stafford Springs) for a long weekend. My wife and her friends were hitting estate sales before the spring Brimfield show and so I had the perfect excuse to sneak away for days of fishing. 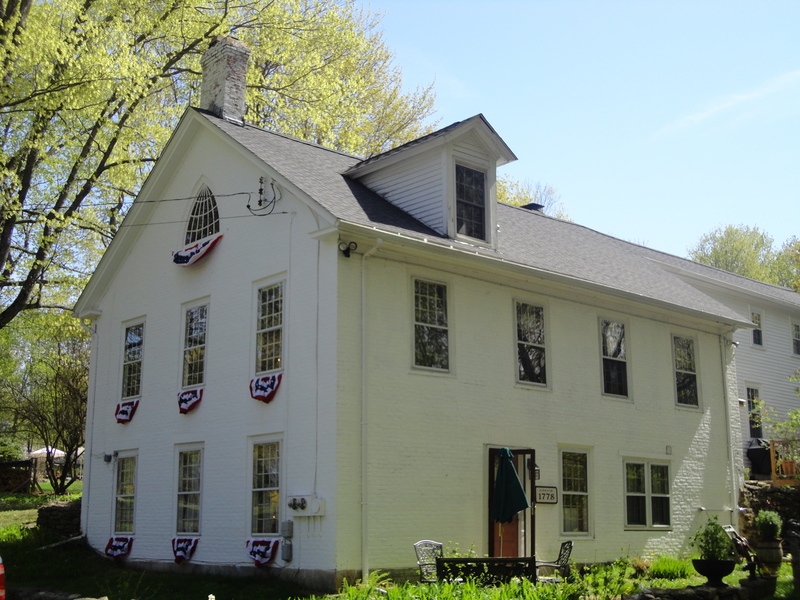 We stayed at Angelina’s Innkeepers Inn in Stafford Springs. Our second visit with her–was delightful. Angelina makes a mean “hooligan’s pancake” (a Finnish pancake called “pannukakku”) and her stories are endless. She’s a treasure trove of info on antiquing and “picking” the area. Sadly, she sold the place and we’ll miss her hospitality next fall when we come up for the next Brimfield. 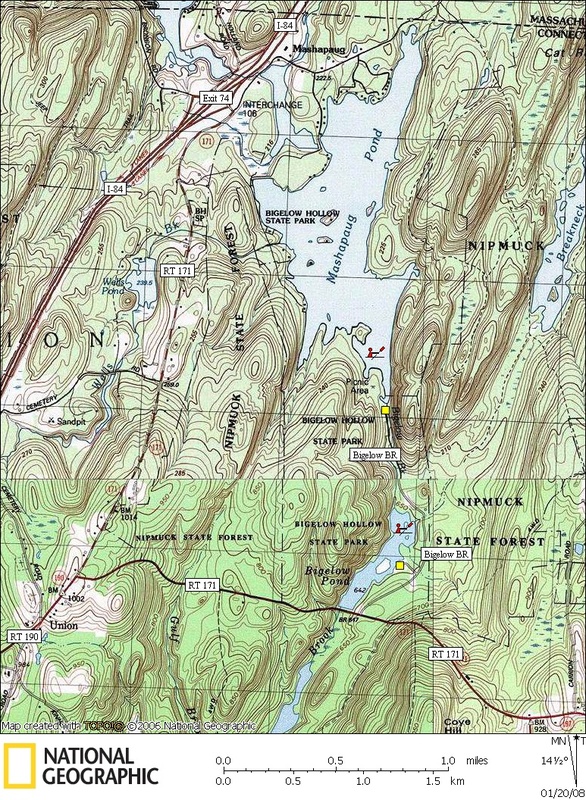 In my exploration of the area, and from tips from CT Fish Talk forums, I decided upon the nearby Nipmuck State Forest area and two lakes: Bigelow Hollow and Mashapaug. Both are called ponds, but at a combined 60+acres I’d say they qualify as lakes. 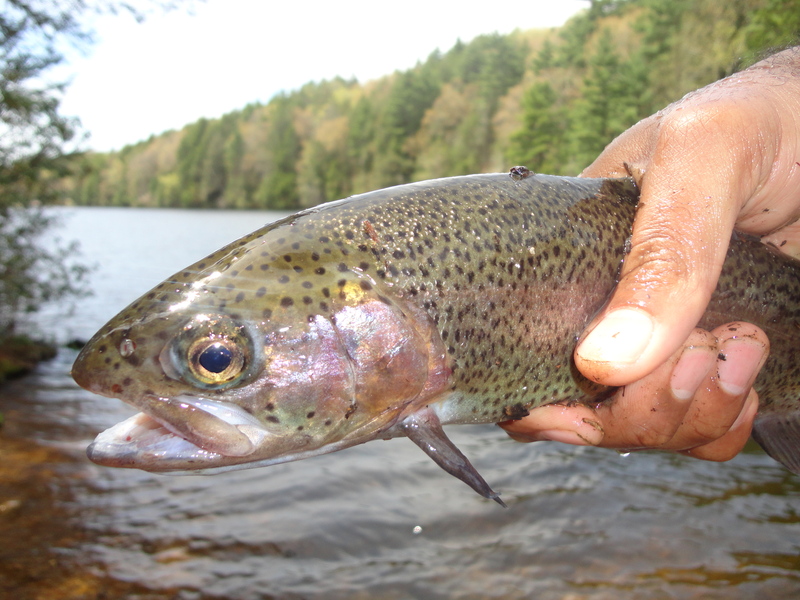 Both are stocked with trout (Rainbow, Brown) and Mashapaug holds Walleye. 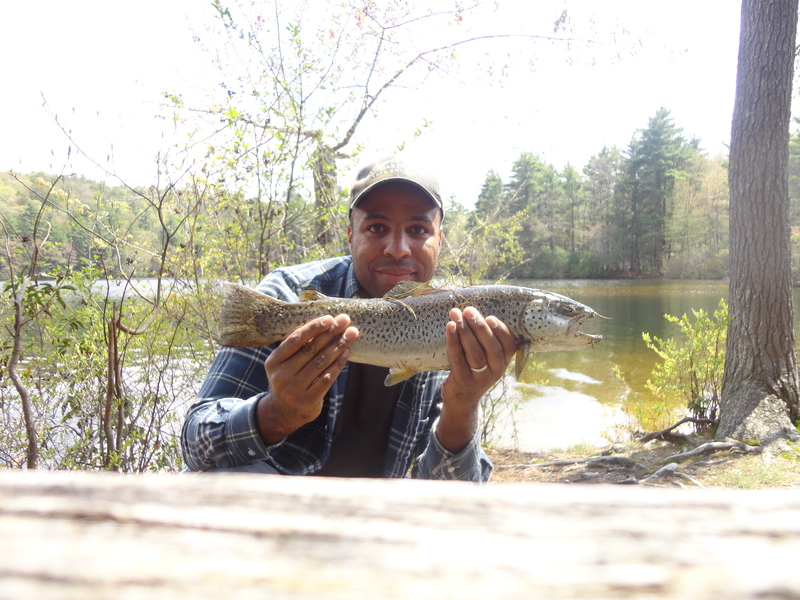 Since I was shore fishing, I targeted trout and bass. My goal was a brown trout especially. A slam (rainbow, brown, and bass)…a grand slam (add Walleye) was out of reach as these are found deep and targeted at night. Armed with some intel from JT’s Fly Shop in Union, I hit both lakes over three days. 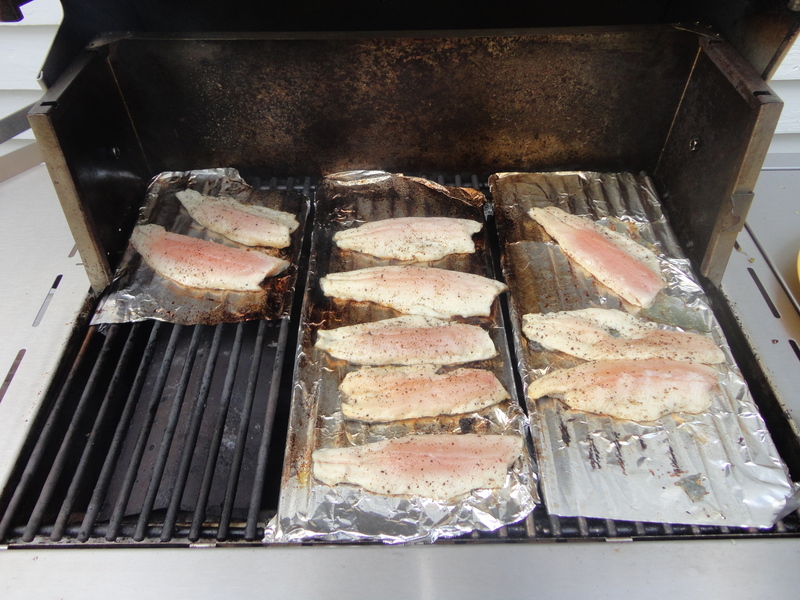 The results were excellent, with a nice variety of fish each day (rainbow, brown, LM, perch, pumpkinseed, crappie). I actually caught and released about twenty ‘bows over the course of the weekend in vary lengths. I found them taking powerbait, and worms in deep coves and on flats too. 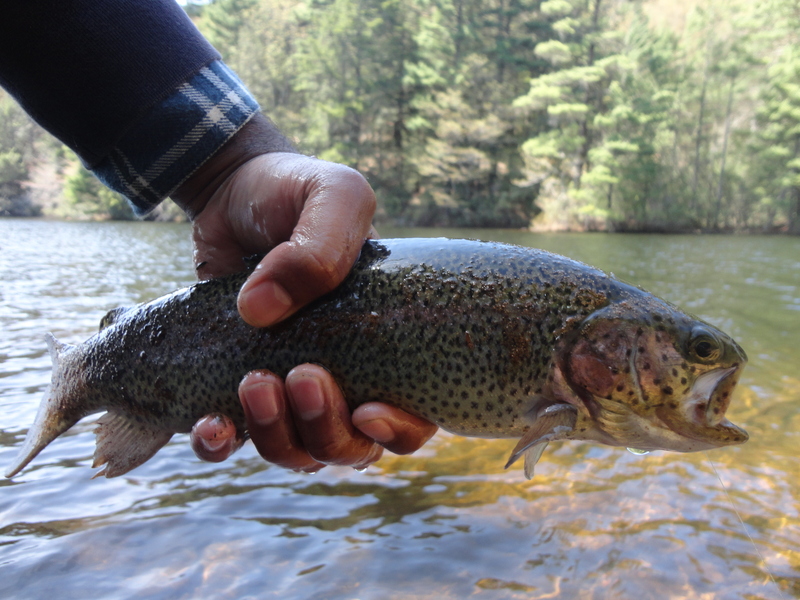 There is no minimum size for trout in CT and a limit of 5 per day. 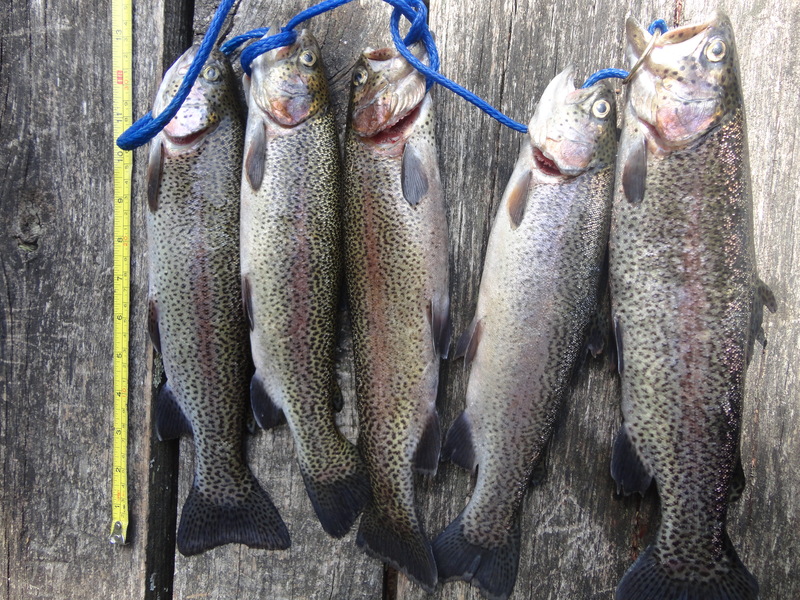 So when I finally got into the bigger ones–13″ or more, I kept a limit. 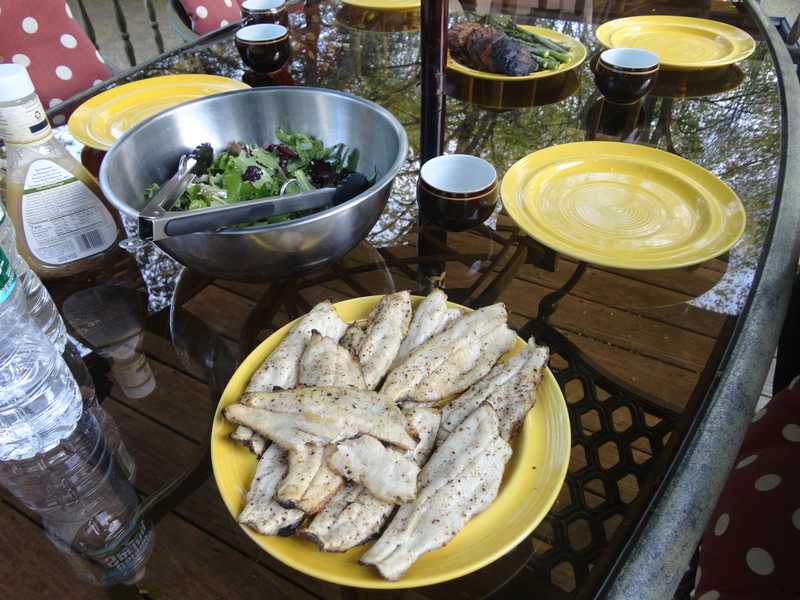 We grilled them up for dinner! The next day at Mashapaug, I hiked several coves until settling on fishing a point on Rock Island with a 30′ flat running into a drop off. My guess was the trout were in the deeper part off the cove and that they may occasionally forage the flat–they did not disappoint me! I watched two browns swim in and just as I was casting out got a backlash! I pulled my secondary rod with a superworm on it but a couple of nibbles and the trout spit it. I retied and cast a texas-rigged crawler and BAM the trout nailed it, put up a good fight, tail-walked a bit and I got it in. 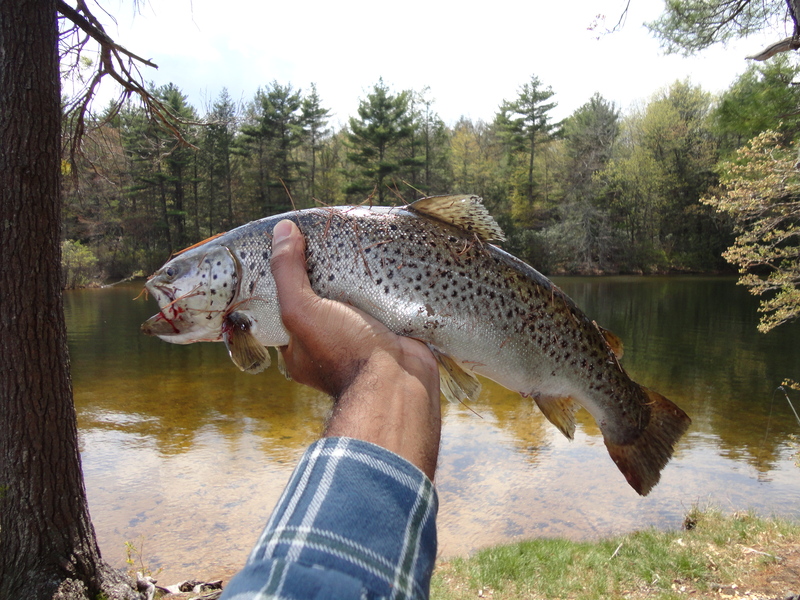 My first brown trout! It came in at about 20″, my guess, 4-5 lbs. 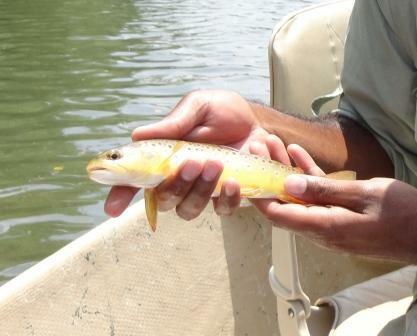 I was catch-and-release that day so he got to go back in the drink–maybe he’ll become a trophy brown some day. 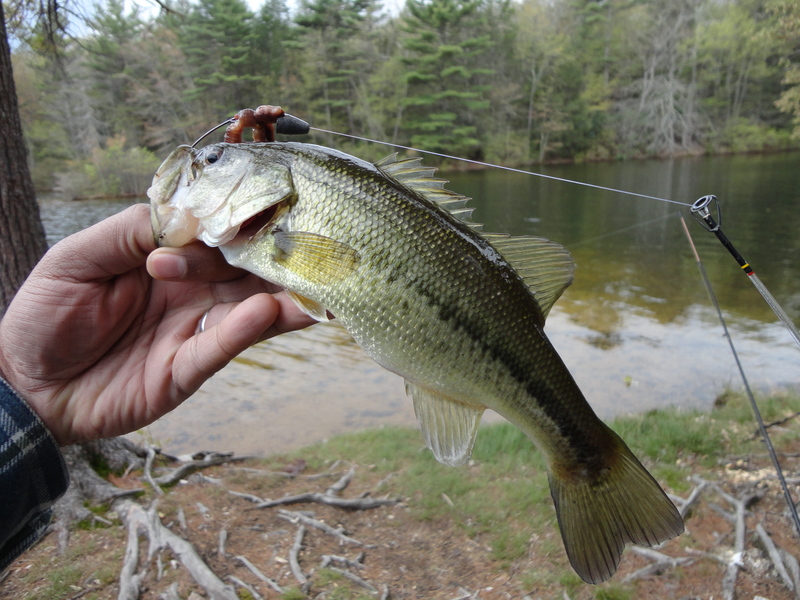 I ended the trip on the third day with more rainbows, perch and a 10″ largemouth bass. I can’t wait to go back in the fall and fish for the browns again though.